Posted on Mon, Feb 20, 2012 : 5:12 p.m.
University of Michigan students fill the corridor inside of Mason Hall around midday, heading to and leaving crowded classrooms. University of Michigan freshman applications have reached an all-time high and most of the increase is coming from out-of-state applicants. Provost Philip Hanlon told a group of faculty Monday that the school has received 41,600 freshman applications to date, compared to 38,700 at this time last year. U-M received 39,570 applications total for entry to the 2011-2012 freshman class, a record at the time and a 25 percent increase from the previous year. Hanlon said he expects applications this year to outpace last year's record by 10 percent. "Almost all of the growth is in the non-resident applications," Hanlon said at a Faculty Senate Advisory Committee on University Affairs meeting in the Fleming Administration Building. University officials have attributed the uptick in applications largely to the school's switch to the Common Application for entry into the 2011-2012 freshman class. "Students... love the ease of applying to the university using the Common App,” U-M Admissions Director Ted Spencer told AnnArbor.com. Despite the increase in the number of applications, Hanlon said the university does not plan to increase the size of its entering freshman class. That decision, he said, is largely due to space constraints. Hanlon said U-M cannot admit a larger freshman class without proportionally increasing the faculty size. "Where do we put everybody? Where do we put our labs and departments?" Hanlon said. U-M this year enrolled 27,400 undergraduates, 2,400 more than preferable, according to Spencer. Roughly 6,300 of this year's enrollees are freshman. The school wants that number below 6,000 in 2012-2013. The result of a larger applicant pool and a smaller freshman class? Greater selectivity. 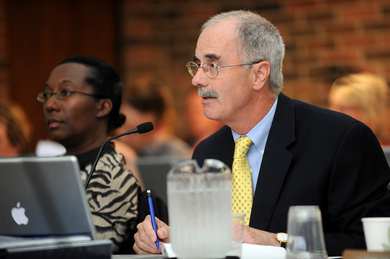 Hanlon noted that the academic profile of freshman students has steadily improved. "If you take a 10-year look at average SAT or average ACT score, it's really quite impressive the improvement," he offered. The school's undergraduate application deadline is Feb. 1, but U-M does receive additional applications after the deadline. Those are considered on a rolling basis. Tue, Feb 21, 2012 : 4 p.m. I am in earnest -- I will not equivocate -- I will not excuse -- I will not retreat a single inch -- AND I WILL BE HEARD. Tue, Feb 21, 2012 : 2:48 p.m.
Tue, Feb 21, 2012 : 10:10 p.m.
Never question the power of an informed (or enflamed) parent. The University of Virginia, considered by most to be a peer to the UM, and Virginia Tech, came under a barrage of criticism several years ago when groups of in-state parents saw their high performing children turned down for admission. This was coupled by increasing numbers of out-of-state (and the greatly increased $$$ they brought along with them) being accepted. They went to their LEGISLATORS and either got a law or an agreement from the schools setting a percentage of in-state students required to be admitted. Using out-of-state students as a cash cow has long been a practice, but when you begin to bite into the in-state dreams of students and their parents - watch out. The best piece of advice I can give you is to make sure your children apply EARLY. If they have the grades and a passion for a certain career field, applying early gives them better odds of getting accepted. Tue, Feb 21, 2012 : 6:58 p.m.
Foreign students also means the state of Michigan is finally exporting something -- education -- that doesn't have four wheels and a motor. Tue, Feb 21, 2012 : 6:57 p.m. It's not just about &quot;who has the cash to pay.&quot; Universities have big upfront costs. What foreign or others paying full out-of-state tuition is much more than the cost of adding one more student. So these students are effectively subsidizing Michigan students/preventing budget cuts. Tue, Feb 21, 2012 : 2:51 p.m.
Then should there be a quota system for local students before letting in more qualified out-of-area students? Tue, Feb 21, 2012 : 2:44 p.m.
After all the recent press about fraud in applications coming from the PRC, I hope that they have additional admissions officers doing extra due diligence on their legitimacy - at least half of all of these applicants have been found to have engaged in fraud. Tue, Feb 21, 2012 : 3:10 a.m. I'd like to know what percent of these are US citizens. Wed, Jun 20, 2012 : 12:05 a.m.
Tue, Feb 21, 2012 : 1:36 p.m.
Tue, Feb 21, 2012 : 1:50 a.m.
if people from michigan want to send their kids to u of m and afford it, they should be ready to pay more taxes. Tue, Feb 21, 2012 : 1:38 a.m.
@kafkaland, if you are confident that &quot;virtually all Michigan students who have a chance of getting in are already applying&quot; that's great. It would be interesting to see the origins of your optimistic statement. I should rephrase my comment from &quot;not the best news&quot; to potentially worrisome. Given the high cost, even in-state, of UM tuition, the worry is that the school has priced itself out-of-reach of hard pressed residents in this economy. If the provost had indicated a more even balance than &quot;almost all in non-residents&quot; it would be a better trend. This one needs watching. Wed, Feb 22, 2012 : 10:15 p.m. Sorry, put the reply in the thread above. @SEC, agree - they have to live somewhere. I like Bridge's effort to move beyond usual bumper sticker cost advertisements. Wed, Feb 22, 2012 : 5:37 p.m.
@Arborcomment, the magazine article isn't just tuition and fees, it includes housing also. Tue, Feb 21, 2012 : 9:57 p.m.
Letsgoblue: numbers cited were from two well researched Bridge Magazine articles. The best of the two for numbers is <a href="http://bridgemi.com/2012/01/college-tax-burdens-students-state/#.Tw35qWDGXZx" rel='nofollow'>http://bridgemi.com/2012/01/college-tax-burdens-students-state/#.Tw35qWDGXZx</a> It explains their methods to determine costs and ranks with peers. A link to peer ranking methodology is provided in The Bridge article. Peer rankings were done by the Carnegie Foundation. Tue, Feb 21, 2012 : 5:53 p.m.
UM tuition and fees (<a href="http://www.finaid.umich.edu/TopNav/AboutUMFinancialAid/CostofAttendance.aspx)" rel='nofollow'>http://www.finaid.umich.edu/TopNav/AboutUMFinancialAid/CostofAttendance.aspx)</a> show an in-state cost of about $12,634 per year (18 hours ). UNC (<a href="http://admissions.unc.edu/Aid_and_Scholarships/Tuition_and_Fees/default.html)" rel='nofollow'>http://admissions.unc.edu/Aid_and_Scholarships/Tuition_and_Fees/default.html)</a> is $7008 per semester (in state). MSU (<a href="http://ctlr.msu.edu/COStudentAccounts/TuitionCalculatorSpring.aspx)" rel='nofollow'>http://ctlr.msu.edu/COStudentAccounts/TuitionCalculatorSpring.aspx)</a> tuition and fees (in state) are $8,567.75 for 21 hours. Then there's Vanderbilt (<a href="http://admissions.vanderbilt.edu/financial-aid/facts.php)" rel='nofollow'>http://admissions.vanderbilt.edu/financial-aid/facts.php)</a> with in state tuition/fees of $40,320 per year. Tue, Feb 21, 2012 : 12:22 p.m. There was no way I could afford to go to UofM as an out-of-state student, despite an academic scholarship. I footed my education myself, and ended up at an Ivy League school that offered me more tuition assistance than UofM did. I imagine there are a number of rather wealthy alums and parents who can foot the out-of-state bill no problem. This is my guess based on the numerous kids I see driving Cayenne's, Land Rovers, and BMWs around campus. What's sad is that I'm sure more qualified kids are missing out, it's easier to accept a check for full tuition than to administer financial aid. Tue, Feb 21, 2012 : 3:55 a.m.
@Arborcomment: UM's in-state undergraduate tuition is NOT $16K+; it is several thousand dollars less. And, what peer group are you talking about? UM is not even the highest in the Big 10 - and MSU is about to pass UM in resident student cost. Please check your facts. Tue, Feb 21, 2012 : 3:14 a.m. So what we don't know is the delta of how many don't even bother to apply because of cost. Sure some financial aid is available, if you meet the lower threshold. It's the great middle that's being squeezed. In the meantime, student loan debt has climbed 38% from 2007-2010. In-state tuition at UNC is $8,423. In-state at UM is $16,888. UM is the highest priced in their peer group of 12 public universities for in-state tuition. And yes, a factor has been declining state funding for the last 10 years. But I find it hard to believe that faced with state funding reductions, the response UM administration touts is a 16 page report detailing cuts and efficiencies put in place to save money over the last decade. Surely the &quot;Leaders and Best&quot; can move beyond a 1.6 page a year plan? This coupled with a banner endowment, hundreds of millions in non-directed spending budget, nonsense bidding wars for administration salaries is not a shining example of making affordability a priority. Tue, Feb 21, 2012 : 1:55 a.m.
Ok, I wish I could give you hard nbumbers to back up my statement, but I doubt they exist. I have talked to a lot of high schools and community leaders across the state, and I virtually never hear &quot;please convince this kid that UM is a place that can offer him or her a great education&quot;, I almost always here that it's too tough to get into UM. Academic selectivity, in my opinion, is a good thing when you want to have a top-notch univeristy - and kids who don't get into UM still have plenty of other in-state places to go that are less selective, or cater to different interests, like MSU for the agricultuaral / veterinary crowd (UM doesn't offer anything for them), to strong regional univeristies like Grand Valley State. I do take the issue of affordability seriously, and so does UM. In-sate financial aid is designed to support every deserving student so that he or she can study here. That is not the case for out-of-state financial aid - plenty of deserving students from other states are not offered any help. That skews the out-of-state polulation towards the well-off, which is a problem, but the resources just aren't there and the priority is on in-state to do otherwise. 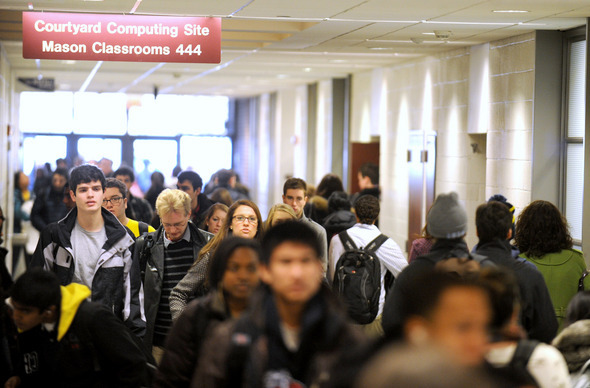 Tue, Feb 21, 2012 : 12:38 a.m.
@Arborcomment: Virtually all Michigan students who have a chance of getting in are already applying. So where should the growth come from? Less than qualified Michigan students? Turning all of them down would help with the rankings, but not substantially improve the quality of UM. Having more top-notch stidnets from all around the country applying and giving the Harvards and Stanfords a run for their money can only improve the quality of the educaton here. And who knows, maybe some of the best and brightest kids from MA or CA will actually stick around and start a business here, or come up with the next great cancer treatment? Wed, Feb 22, 2012 : 10:11 p.m.
SEC, agree - they have to live somewhere. I like Bridge's research beyond the bumper sticker costs most schools advertise. Tue, Feb 21, 2012 : 10:24 p.m.
We should always give the Harvards and Stanfords a run for their money while balancing one important factor. In response to some questions below, I looked at Michigan costs compared to &quot;peer&quot; instituitions. Always a debate which schools are above, below, or should on the list in the first place. What struck me was Michigan's high cost compared to other Universities with the word &quot;OF&quot; in their name. That little preposition, meaning &quot;from&quot;, &quot;made from&quot; or &quot;belonging to&quot;. Let's not loose that definition in a chase to keep up with the Harvards, Yale, Stanford, and other places without that little word. Mon, Feb 20, 2012 : 11:15 p.m.
Tue, Feb 21, 2012 : 8:58 p.m.
Tue, Feb 21, 2012 : 1:43 p.m.
Mon, Feb 20, 2012 : 10:40 p.m. So much for all the Higher Education bubble talk.